Robots in the health care industry are growing more and more popular with both patients and hospitals. Here's the reason why. The use of robots in care giving examples is growing in popularity, with a team from the University of Lincoln deploying automated carers in care homes in Britain and Poland. It is hoped that the system will provide caregivers the opportunity to spot trends in the cognitive performance of patients and gain early warning of potential emergencies. For instance, the patients mood could suddenly change and signify a need to step in. “If the robot detects that the mood of the person is particularly low, it might suggest some kind of game or interaction with relatives. It could record information on how the mood changes and provide professional staff with feedback over a period of time, which would be very useful when studying the evolution of particular cognitive impairments,” the authors say. A recent study from a team of New Zealand based researchers provides a bit of evidence from a recent deployment of robot carers. 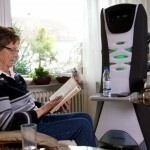 Participants in the study were given a robot carer in their home for a three month trial period. Interestingly, whilst more expected benefits emerged such as being reminded to take medicines, the participants also appreciated the companionship provided by the robots. “The results suggest the healthcare robots were feasible for use with a rural population and may have benefits for some patients in reducing the need for medical care, increasing quality of life, reminding patients to take medicine on time, and providing companionship,” the authors say. Pretty much every participant in the study reported missing the robot when it was no longer a part of the household furniture, suggesting a surprising level of acceptance and intimacy. The researchers suggest a number of ways in which such personal robots can be improved in future, including using games to better engage with older people, and a generally friendlier interface. It is often extremely challenging providing adequate care for elderly people as many live in rural communities that lack both the social and transportation connections required for good care. Automated support can therefore prove very useful, and whilst there have been various experiments with methods such as telemedicine, it seems clear that robots can play a strong role also. Suffice to say, the study contained a relatively small sample, so it would be foolish to read too much into the findings, but they do nonetheless provide a degree of encouragement and prompt further exploration into the possibilities for robots to fill a gap in caring for elderly patients in their own homes. Written by Adi Gaskell of The Horizons Tracker.